Granted, she had lived a full life, but oh, that such a voice could be silenced. How was that possible? But the longer I live the more it sinks in that not only is death an inevitable part of life, but knowing and acknowledging the impermanence of our existence is what makes each moment of our lives so precious. And oh what a life Maya Angelou lived, the joys she rose to out of a past of pain. You can read more about her life in the link above, and in countless tributes, articles and blog posts this week. I particularly was moved by this piece from Amy Goodman in the Spokesman Review. Nobody can deliver a poem quite the same way as Dr. Angelou. In fact I’ve only recorded a few of her poems in the past, as she has such marvelously melodious readings herself online. But the one I will share with you today was introduced to me the day after her passing, and it seemed so appropriate. It even captures that feeling of unreality, that inability to believe that I felt when I saw that headline. A great tree has fallen. A great soul has died. Later, while struggling with my beliefs, and the circumstances of my life, attempting to come out of, not the closet, but denial (they say the Nile is more than just a river that runs through Egypt), a beautiful young friend gave me the booklet of that single poem, “On the Pulse of the Morning,” as a gift. The reminder, the written words gave me hope, hope that my life might actually make sense again. I realized eventually that I enjoyed studying the Bible more as literature than as something to be taken literally. And eventually giving myself over to studying various world mythologies and the way we humans explore truth and attempt to understand ourselves through literature, particularly poetry was the thing that set my heart on fire. Poetry probably saved me more than anything else. And maybe that moment with my boss was the beginning of my desire to help people “get” poetry, to let them know that it doesn’t have to be some unreachable experience, and that if you do find yourself confused, you might just enjoy the music of the words until they start to sink in. Poems like “On the Pulse of the Morning” are not unknowable, even when enigmatic or ambiguous. In fact, it’s best to embrace a bit of ambiguity when reading poetry. A multiplicity of possible meanings is one of the virtues of the art. Part of the problem folks have with poems is simply that traditional ears have still not become accustomed to “poetry that doesn’t rhyme.” Oh, how many times I’ve heard that indictment. 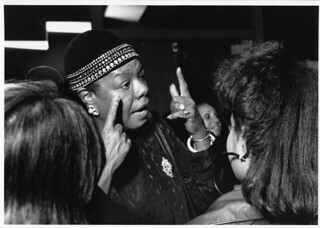 And even this week in the dreaded comments of articles I saw it rear its ugly head again, and I thought surely you people haven’t really read Maya Angelou. It seems to me with the exception of a small number of poems, including her inauguration piece and “When Great Trees Fall,” most of her work rhymes and rocks metrically, in a bluesy sort of way. And maybe that experience with my boss also had something to do with my dislike for poetry which is purposely designed to leave the human out of the humanities, poetry that wants to shut you out rather than draw you in. It seems fashionable to some to eject emotions entirely, rather than risk the failure of navigating them with skill. Better, some seem to think, to pretend emotions aren’t important. Intellect is integral to humanity. It is necessary for the process of moving from observation toward understanding. Skilled artifice is beautiful, fun, even exciting, for both the artist and the partaker of the art. But intellect and artifice, without emotion, cannot create art. It may be “emotion recalled in tranquility.” It may be emotion carefully held in tension, but the emotion must be there or it is not art, but rather mere construction. If you ignore the soul, the spirit, whatever it is that kicks you in the gut, or makes you gasp quietly, you might as well be designing a crossword puzzle or a word scramble. Why not just play scrabble instead of attempting to write poems? Granted, while the heart beats it need not bleed all over the page. And I wonder if the fear of doing so is what keeps the post-modern language poets from writing much of anything that moves me. Maybe it’s their dread of being thought sentimental. It couldn’t be a lack of skill, or understanding, could it? Not knowing that a creator of art must be something more than a machine, a calculator, or a dictionary. I would like to believe it’s not a heartlessness as much as it is a fear, or a fashion. Sorry, I’ve turned a memorial post into a rant. But Maya Angelou has been criticized for being overly sentimental, “too simple,” too “accessible.” And I am obliged to disagree. The following poem can speak for itself in that regard, so I’ll not go on about it any further. I’d rather let Dr. Angelou’s poem make the case and have the final word. Her great soul will be missed. People like Ms Angelou – and their ideas – never really die while their words remain – it’s why oppressors first see off the intellectuals, the artists, the poets; it’s why they burn books. And when a poem touches you, as you describe here, and affects your life in a momentous way (and how wonderful that it led you to ‘explain’ poetry to the uninitiated and initiated alike), the ripple effect is unknown (who knows how many people have not given up on poetry as ‘too difficult’ because they read your blog?) but guaranteed. A wonderful post, David; one of your best. She will be missed; but not forgotten. we’re nothing,if we don’t know how to get humble every once in a while. lovely choice david,and gently spoken to us. An excellent reading and post. Thank you, Charles. I appreciate that! This is a beautiful post in homage to a Beauty-full and “Phenomenal Woman”. I found your blog (and am now following you) through another blog. Maya touched more lives than she knew … perhaps now, from her elevated perspective, she has a better idea … and is dancing to all of the music she inspired.